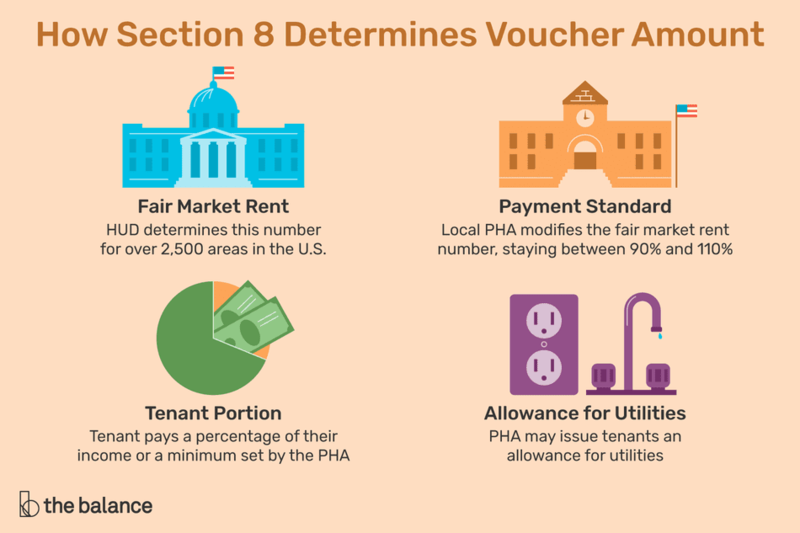 Section 8 will determine how much they will pay for each voucher based on a number of factors. The maximum amount they will pay will vary based on standards such as the town you live in and your income level. The amount of the Section 8 voucher may be more or less than the amount the landlord could receive for the rental on the open market. Here are the four main criteria Section 8 will consider. The first step in determining the voucher amount, is to calculate the Fair Market Rent for the area. Each year HUD comes up with this number for over 2,500 areas of the country. Units that are less than two years old. Units that have been rented at what they consider to be below-market rent. HUD uses two bedrooms as the standard for calculating Fair Market Rent. It then derives the rents for all other bedroom sizes from the Fair Market Rent for the two bedroom. The Fair Market Rent is set at a level that is in the 40th percentile for the rents in the area. This means that 40 percent of the units in the area rented for less than this amount and 60 percent of the units in the area rented for more than this amount. Therefore, it is slightly lower than the median rents for the area. The Fair Market Rent for certain metropolitan areas will be set at the 50th percentile instead of the 40th percentile. Landlords will be more willing to participate in the Section 8 program because they can receive a decent rent for the unit. Low-income tenants will be able to afford their portion of the rent. Each local Public Housing Authority will then use the Fair Market Rent that HUD has set as a guide. The PHA will look at factors in their specific area such as, how long it takes a Section 8 family to locate housing. The local Housing Authority will determine their payment standard, or the maximum amount they are willing to pay for each number of bedrooms. This payment standard will be between 90 and 110 percent of the Fair Market Rent. The Fair Market Rent that has been set for the metropolitan area where your property is located. HUD publishes their list of Fair Market Rents each year. The payment standard set by the Public Housing Authority. The number of bedrooms your unit has. 30 percent of their monthly adjusted income. 10 percent of their monthly gross income. The minimum rent amount set by the PHA. The tenant portion will be paid directly to the landlord by the tenant. If the rent for your unit is set at a higher amount than the payment standard the PHA has set for the unit, the tenant can elect to pay more. They are allowed to increase their tenant portion as long as the amount they will pay is approved by the PHA and does not account for more than 40 percent of the tenant’s monthly adjusted income. If utilities are included in the monthly rent, the Public Housing Authority will usually include an amount for utilities when issuing the housing choice voucher. If the rent for your unit does not include utilities, the PHA may issue the tenant a separate amount for utility allowance or may issue a utility reimbursement directly to the tenant or directly to the utility company. Landlords who have property that would rent at or below the average rent for the area could benefit from accepting Section 8 tenants. This is because they may be able to receive higher rents from these housing choice vouchers than they would in the open market. In addition, you will be paid consistently each month by the Public Housing Authority. For those landlords with units that would rent above the average rent for the area, participating in the housing choice voucher program may be a disadvantage. It could result in you receiving a lower monthly rent than you could receive in the open market.